3 bedroom, 2 bath cabin. There are two bedrooms on the main floor, one with two queens and the other with one queen. Kitchen is fully equipped and living room has sleeper sofa and a fireplace. Upstairs is two queen beds and a bathroom with shower. This cabin is airconditioned and has a deck that overlooks the lake. Birchwood A Sleeps 12. 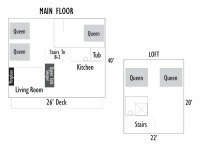 The birchwood A (upper level) and Birchwood B (lower level) cabins can be rented seperately or combined. 2 bedroom 1 bath cabin. 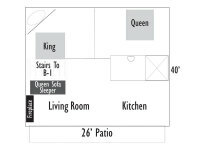 One bedroom has king size bed and the other bedroom has a queen bed. Bathroom has a shower. 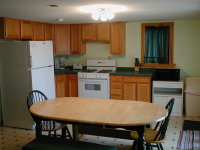 Fully equipped kitchen and the living room has a sleeper sofa and gas fireplace. This cabin is air conditioned and has a patio overlooking the lake. The Birchwood A (upper level) and Birchwood B (lower level) cabins can be rented seperately or combined.